For over four decades Buckeye Fire Equipment has been an international leader in the development and manufacture of reliable fire protection products. A privately owned and operated company with its headquarters near Charlotte, NC, Buckeye Fire Equipment has earned an excellent reputation for quality, reliability and value within the commercial and industrial fire protection industry. They offer a complete line of handheld and wheeled fire extinguishers, extinguishing agents, fire suppressing foam concentrates & hardware and pre-engineered kitchen suppression systems. To ensure their customers get the highest quality fire protection equipment, all of their products undergo rigorous testing, both in-house and by third party testing organizations such as Underwriters Laboratories, Factory Mutual, ASME and the U.S. Government. They are committed to helpful and responsive customer service and knowledgeable and dependable technical support. This commitment has earned Buckeye Fire Equipment the coveted ISO 9001-2000 Quality Certification. 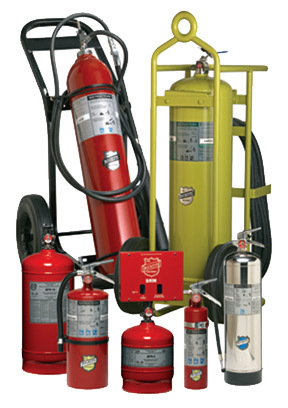 We also carry Spot Protection Extinguishers, Foam Equipment and Concentrates, Mounting Hardware and Parts… Contact Us today!